Tonight I have some nail art and swatches of some lovely polishes from new to me Indie Brand Too Fancy Lacquer, based in Hong Kong. 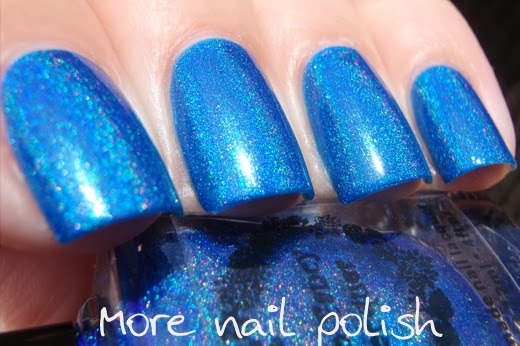 All the polishes are beautiful holos and if you love blue polishes, then you are going to love this collection. First up is my nail art, and I'm quite enjoying challenging myself in creating nail art with polishes that have been provided for review. 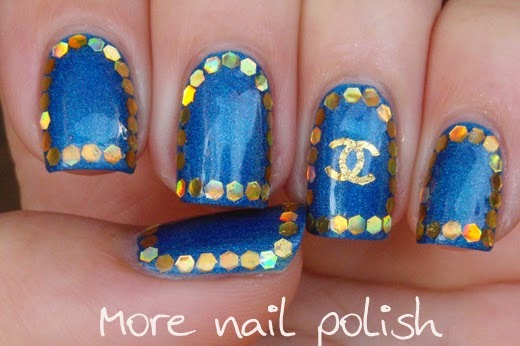 I used a base of Too Fancy Lacquer - Set Fire to the Rain and then placed a frame of gold hex glitter around the nail. 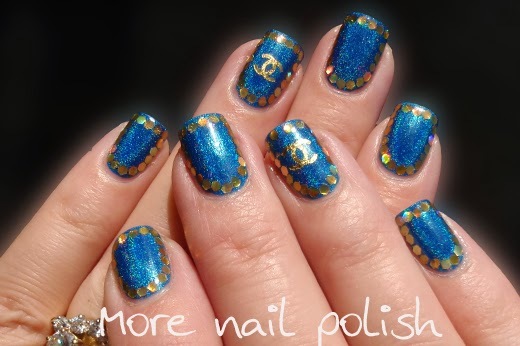 I used a Chanel water decal from the Born Pretty store on my ring fingers. 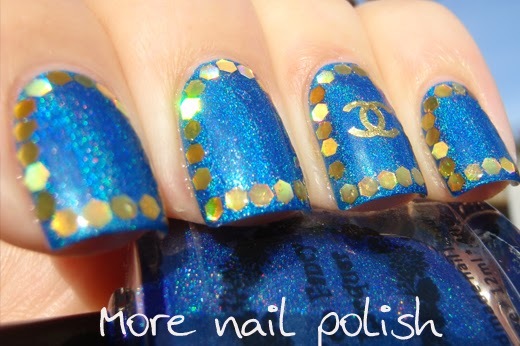 Sammy the Nailasaurus did a very similar design using round glitters and black polish during the 31 day challenge. Now onto the swatches of these gorgeous lacquers. First up is a collection of three blue holographics in the Bluemuda Trio. Set Fire to the Rain is a sapphire blue linear holographic. The holo flame is more obvious in real life, my camera did dull it out a bit (in fact my camera tends to do that with most blue holos). 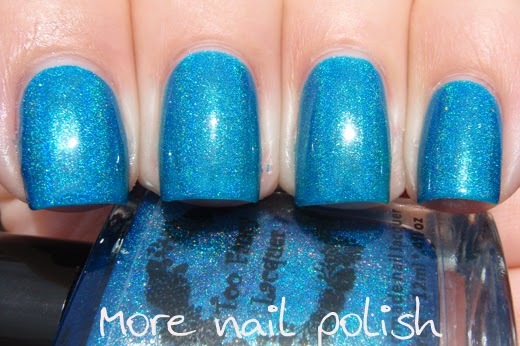 Bejeweled - bright turquoise blue linear holo. Again, way more holo that my photos show. 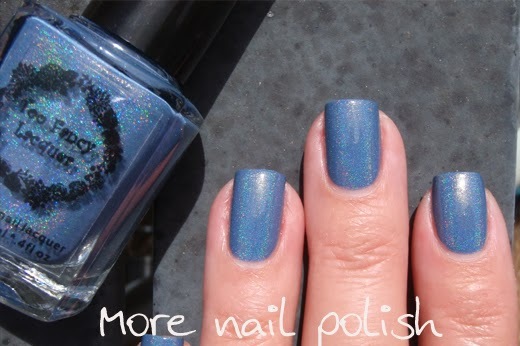 Moody Blue is a dusty denim blue linear holo. 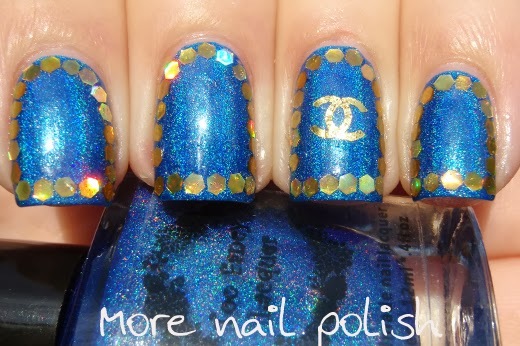 Do I need to say that this is more holo in real life again? Nope, I didn't think so (but too late, I already did). Tell me a sea-cret is a sea foam green linear holographic. 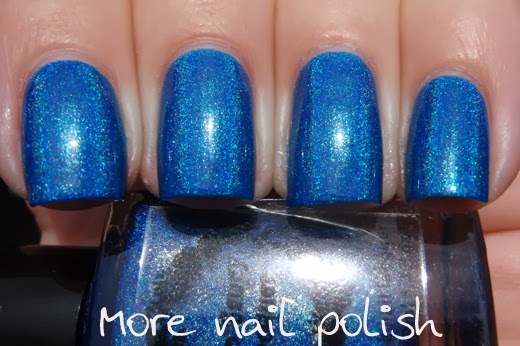 This one isn't part of the Bluemuda trio, but Carmen tells me it's one of her most popular shades, and I can total see why. 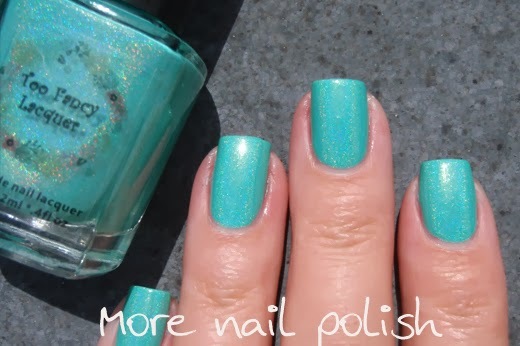 It's that perfect turquoise shade with slightly gold sheen. As well as the holo sparkle that you just can't see in my sun photos! 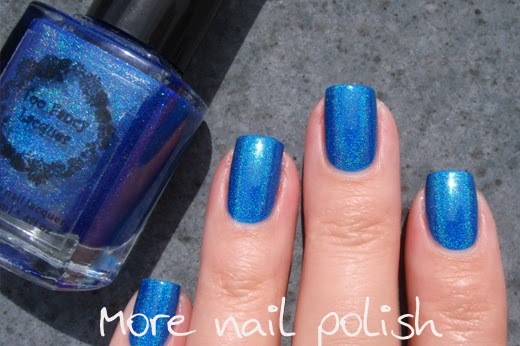 You should check the swatch photos on the Too Fancy Lacquer website, because they capture the holo much better then I have managed to do today. The formula on all these was perfect. 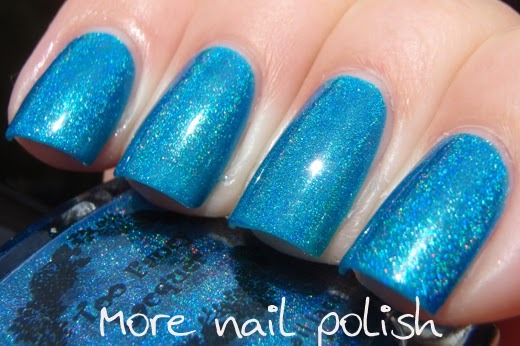 I did two coats of all the blue shades and three coats of Tell me a sea-cret. 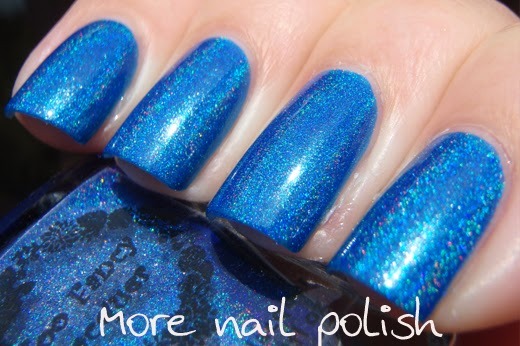 The blue polishes are all so beautifully pigmented, but still with the jelly-ish base that allows the holo sparkles to shine through. 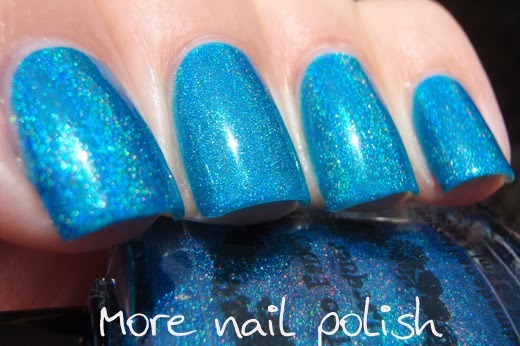 Too Fancy Lacquers are available from their website and they do offer international shipping. Thanks for the gorgeous swatches! I was just wondering how Set Fire to the Rain compares to Emily De Molly Indigo Flow? 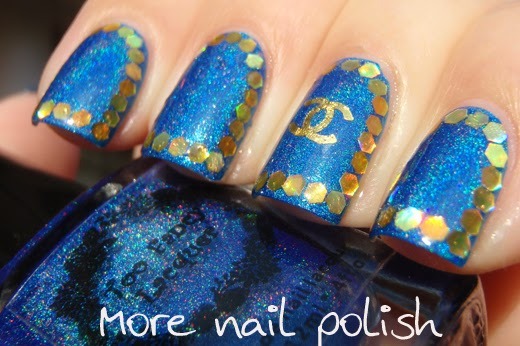 Is it a lot bluer?